MSV: Mayor Zimmer letter to State investigative oversight committee explains SandyGate "nightmare"
Mayor Zimmer letter to State investigative oversight committee explains SandyGate "nightmare"
A letter from Mayor Zimmer to the State investigative committee looking into the BridgeGate and SandyGate scandals addresses for the first time her reason for not going public sooner when she was allegedly pressured to approve the billion dollar Rockefeller project. According to a Star Ledger story, Mayor Zimmer felt links between the governor and the US Attorneys Office would make coming forward "a nightmare." The story says she discussed the dilemma when it first surfaced with Hoboken land use attorney Joe Maritziti. The Hoboken City Council recently voted its approval permitting the City attorney to waive attorney-client privilege so he could fully cooperate with a subpoena issued from the US Attorney's Office in Newark. At the time of the incident with the Lt. Governor, Kim Guadagno, the mayor maintained notes in a personal journal and additional entries were photographed and recently shared with the State investigative committee. "I have now heard it from Lt. Gov. and Com. Constable," she says in apparent reference to the threats to her Sandy aid, which she says were made by both Lt. Gov. Kim Guadagno and Department of Community Affairs Commissioner Richard Constable. "Yes – this is illegal. I debated with Joe Marzati whether or not to go to US Attorney – we decided that Christie has friends throughout US Attorney's office - ..[therefore] not much chance in getting help from them & it could create a nightmare for us. A little scary to realize that there's nowhere to turn for help against this threat from Gov. Christie. My best defense is to stand up to the bully – my beloved Gov who wants to run for president." The mayor's letter also addresses a comment by Governor Christie he would like to have a bill making it illegal not to come forward and report misconduct. The mayor has alleged several members of the governor's administration pushed the Rockefeller project, linking it to Sandy aid. "A law that punishes people for not coming forward immediately could, intentionally or otherwise, have the effect of preventing wrongdoing from coming to light rather than promoting its disclosure," she wrote. Councilman Michael Russo has publicly criticized the mayor for not coming forward and immediately reporting "a crime." His cousin, Councilwoman Terry Castellano agreed in the same council meeting saying the mayor should have reported the "bribe." Back in 2009, Councilman Russo was seen on FBI videotape agreeing to accept a series of bribes and instructed a Jersey City colleague to make out a $5,000 check to his "Russo for Hoboken" from FBI informant Solomon Dwek who was posing as a real estate developer. Russo claimed never to have received the check and he never reported it to the authorities. The FBI videotape was first released in Hoboken by MSV following its investigative stories on the matter after the release of "The Jersey Sting." Better days: Governor Chris Christie came to Hoboken during the Sandy emergency and embraced Mayor Zimmer in an unannounced visit to the Elks. They won't be hugging it out again. Read the entire Star Ledger story here. Talking Ed Note: Severe criticism questioning the mayor's allegations surrounding Sandy aid to Hoboken have been loud, crass and personal. As information continues to come to light, those allegations appear more credible not less. A tip of the hat to Hoboken's Iron Lady is in order. 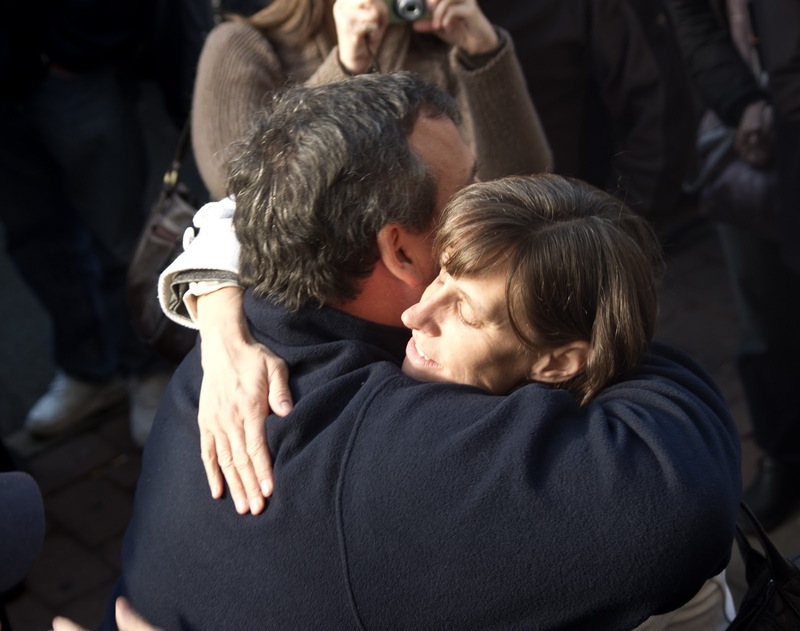 Even from those of us who voted for Governor Christie not once but twice. Did any of us doing so wish to support corruption or the corrupt when we voted for the corruption busting governor? No, but that's the crow we may yet have to eat if the allegations prove true.